Happy National Science Fiction Day! We decided this year that we want to bring you, our readers, even more geeky content. In doing so, we’ve been doing lots of research! One of the things that came up was this holiday! While reading more about the date, we also learned that the date of National Science Fiction Day was chosen because it corresponds with Isaac Asimov’s birthday. We thought it would be fun to share some of our favorite science fiction recipes in honor of the holiday! 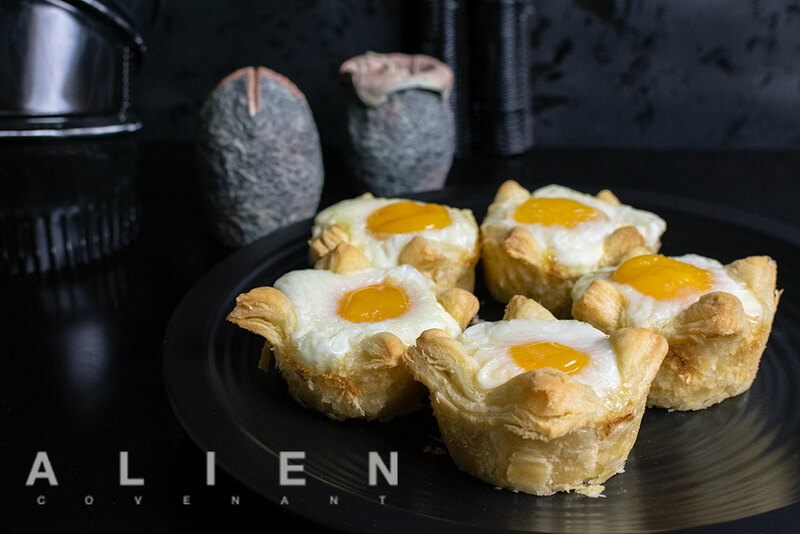 Xenomorph Egg Cups inspired by Alien Covenant– They say that breakfast is the most important meal of the day. Why not start the day with a little science fiction? These egg cups are as easy as they are delicious! 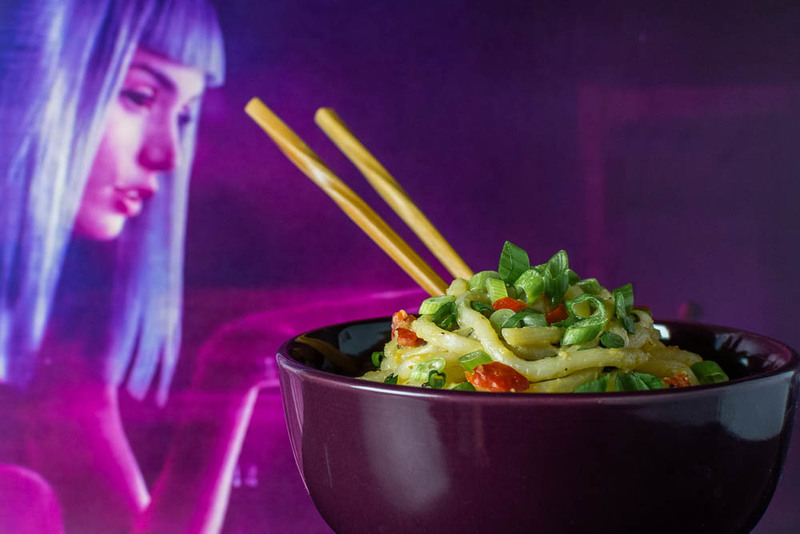 Spirited Noodles inspired by Blade Runner 2049– This recipe is inspired by a dish we tried at San Diego Comicon. A little bit boozy (Johnnie Walker was a movie sponsor after all) and a lot tasty, this dish is the perfect main dish for the holiday! 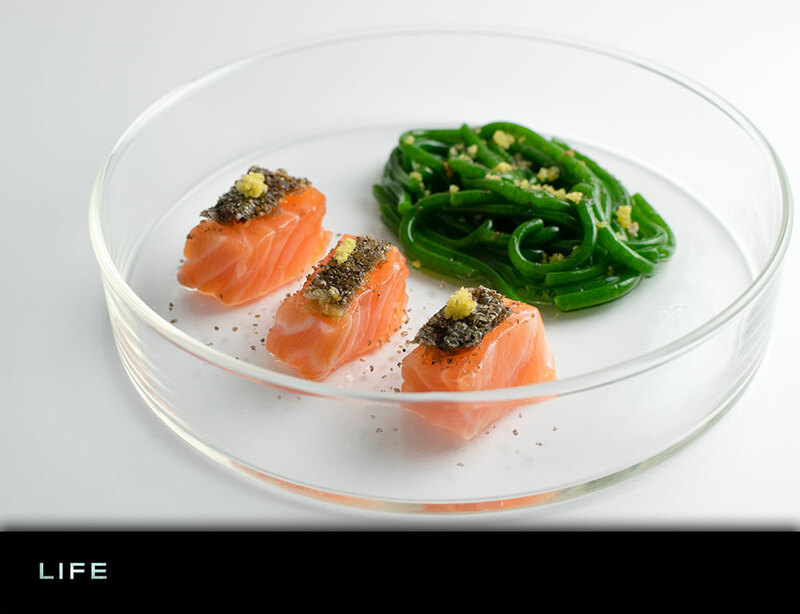 Salmon Crudo with Crystallized Fennel and Spinach “Pasta” inspired by Life– Looking to test your molecular gastronomy skills? Maybe you just want to impress people with your cooking skills. Either way this recipe looks way harder than it is and it sure to impress! 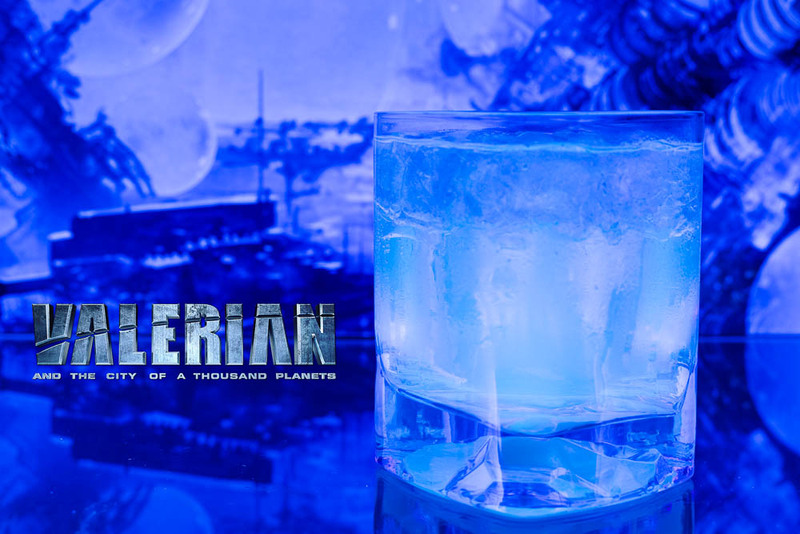 The Alpha Tonic inspired by Valerian and the City of a Thousand Planets– Last but not least, we have a cocktail for National Science Fiction Day! Who doesn’t love a cocktail that glows under a black light? The secret is in the tonic water! We hope you’ve enjoyed our little round up of science fiction recipes! Do you have a favorite geeky holiday you’d like us to write about? How about a science fiction movie you’d like a recipe for? Let us know in the comments below or tag us on social media using the hashtag #GeekEats! Happy National Science Fiction Day! 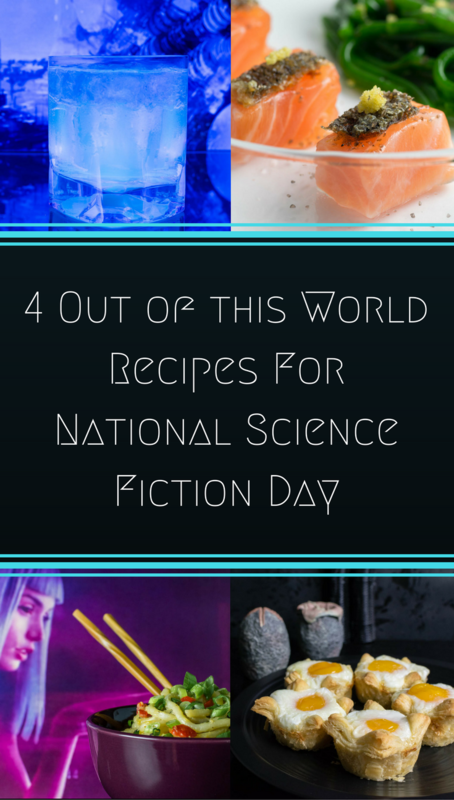 Recipes for National Science Fiction Day, that is awesome! and of course, a post I would be disappointed if you did not write. 😉 I’m all over that salmon with fennel and spinach pasta! Mmmmm. LOL! Right?! That salmon was hard to shoot because we kept wanting to eat it! This would be a fun holiday to celebrate! I’m all over The Alpha Tonic, grapefruit bitters and blue curaçao are great together. It is such a fun and easy recipe! With a black light it is even better! Being a GEEK at heart, I was enjoying your post so much. Great recipes for a Sci-Fi celebration! Haha love the theme of this post! Also – have been meaning to try that glowing tonic water trick forever, thank you for reminding me about it! These are some cool ideas to celebrate a day that not many people know about! Some of these would also be great for a sci-fi b-day party or something! Many great ideas I will have to try! Especially that spinach pasta! Loving the movie/food pairings here. I will admit I have not seen any of these (although you are speaking hubby’s language for sure). If I don’t watch the movies…at least I can make the food LOL! Love this recipe round-up!! So fun and creative! I want to try those egg cups! I’m all over that salmon crudo if someone else makes it for me! I had no idea today was National Science Fiction Day! I wish someone would invent that box that was in Star Trek next gen where food they wanted would just appear… but then whats the point of food bloggers then??? Alpha tonic please! Bubble would approve of this 😉 Bitter sweet and blue. This is such an interesting post! Food inspired by movies, LOVEEE it!! Your recipes are so cool, exciting and fun. I love reading your posts. I’m loving the salmon crudo! I’m sure I would love it! This is such a fun post! Love love love it! That salmon looks great!